Save on Harmoniums at Way North of Nashville. Top brands include Paul & Co., Maharaja Musicals, & Bina. Hurry! Limited time offers. Offers valid only while supplies last. INCREDIBLE! 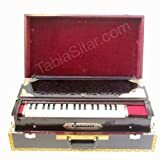 13 Scale Changer Paul & Co. ULTRA-PROFESSIONAL HARMONIUM. Nothing Better Ever Made!